Click the thumbnails to change the selection for the main picture. OUR WEB MASTER WRITES: Regular readers will know that I moved to the hot mountain desert of south west Utah from the very north west corner of England, right on the Anglo Scottish Borders. In my third summer of acclimatization (cutely known in Merkinese as acclimation, and in my case assisted by health improvements), I am beginning to be comfortable with three digit temperatures. Even the rising humidity of late July and August, doubling and more from a normally relatively dry 10% to an occasional 30%, has not caused me too much of a problem. My standard answer is that the Borders is a temperate maritime region, experiencing temperatures about 30°F (17°C) below my new home, and much higher rainfall figures than the scant annual eight inches of the high desert southwest. Superficially this seems to give my companions much satisfaction. However, Plato said the devil is in the detail, and so it proves in this case. Snow falls in the Inter Mountain West are much higher here than in the UK, and lie for much longer into the season; rainfall from electrical storms regularly devastates the land, in a way only rarely seen anywhere in the British Isles; clear winter skies often cause overnight temperatures to fall below freezing, with perceived comfortable daytime temperatures dependent on insolation. The flip side of the detail is equally devilish: south west Scotland experiences ambient three day mean temperatures above the magic 42°F (6°C), so the grass never stops growing, unlike the desert where the clear night skies in winter often produce a nip of frost that halts the grass growth, which in any case requires irrigation; Scotland's Grampian Plateau experiences sub Arctic weather lasting many days and inhibiting activity, whereas snow on the Colorado Plateaus is often followed by fine weather that allows enjoyment of the outdoors. Hey-ho, nothing in life is ever as simple as we like to make out. 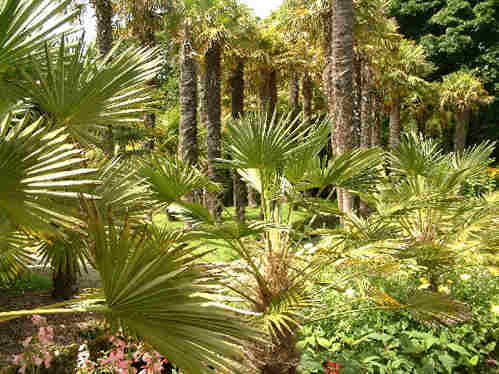 At this point in any comparative weather conversation I always feel it is appropriate to mention Scotland's sub tropical gardens! 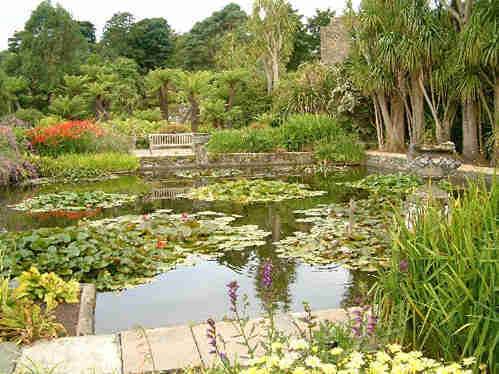 In the sheltered Port Nessock Bay, on the western shore of the Rhinns of Galloway, lies Logan Botanical Gardens, which is now in the care of the Royal Botanic Garden Edinburgh (RBGE). I have wonderful memories of living in that part of the world, and Tony Richards' pictures, taken on a jaunt there from his usual stamping grounds in the English Lake District, certainly rekindled a few. Quirkily Logan lies further to the south than the part of England that was my home. Logan, along with the terraces and parterres of nearby Castle Kennedy Gardens, where I also lived for a time, was used as a location for the 1973 cult movie The Wicker Man. Scotland has many other wonderful gardens, though none as exotic as Logan because uniquely it benefits from the warmer waters at the tail of the Gulf Stream. 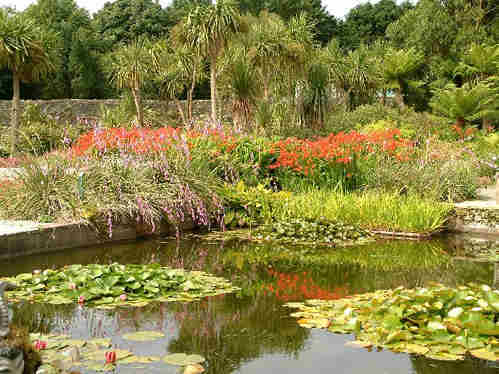 The RBGE lists ten locations that they manage, and Dennis Hardley's ScotPhoto.com has a comprehensive selection of pictures of Scottish gardens that you may view. I enjoyed today's pictures from Tony so much that tomorrow's feature will be a sort of Part II celebration of South West Scotland; included will be visits to the east coast of the Rhinns on the delightful beach at Ardwell; rugged Portpatrick that was the original ferry port for Ireland before relocation to the sheltered waters of Stranraer in Loch Ryan; and finally the walled garden at Threave, in the lands of the Black Douglas! For a Scottish vacation with plenty of amenities and places to visit, but without the crowds, Dumfries & Galloway is highly recommended. Italian politician (1883-1945). The dates are an easy giveaway for the informed, but for those under the age of forty, or a little vague about European history of the first half of the 20th century, we have tried to present a few teasing snippets. This man was known as 'Il Duce', and also as 'The Man Who Made the Trains Run on Time' - something he claimed to have done, but allegedly achieved by the simple expedient of threatening to shoot the responsible officials, starting with the top man, until the rail system ran satisfactorily. His supporters wore black shirts, and their political views became known as Fascism, a name derived from the symbol of Fasces, otherwise a bundle of sticks in Ancient Roman iconography representing strength through uniting in numbers. Brad DeLong has a neat summary of those troublesome 'isms' of the 20th century. An excellent pictorial history web site by David Lowe documents the rise and fall of this man - [WARNING: contains graphic images of violent events]. There is a BBC Education web page that tries to simplify the complexities of European history leading up to World War II. A locator is available from the FindaChurch.co.uk searchable database. This is St. James' or Buttermere Church in the English Lake District. The carved angel was commissioned from landscaper and sculptor Jonathan Stamper after thieves stole the original from the church. Other criminals have passed this way: in 1802 a plausible scoundrel by the name of John Hatfield arrived in the area. Passing himself off as being of high born social status, he courted Mary Robinson, who was known as the 'Beauty of Buttermere'. The full story may be read on Steve Bulman's web site. Wordsworth and JMW Turner passed this way, the latter painting a rather dull scene that is in the Tate Gallery collection. Another visitor was Robert Grindell of Manhattan in search of his forbears. He did discover the true story of his grandfather Joseph and laid to rest the fanciful family story. "Oddly enough, though, this discovery did not dampen my pleasure in searching out this part of my family history. If anything, it heightened it. I even have a fonder feeling for my grandfather Joseph whose romantic fib about how he came to the New World gave me, many decades later, the chance to play Sherlock Holmes."